William "Bill" F. Bruso Jr.
William (Bill) F. Bruso Jr., 64 of Raymond, Maine was born in Worcester, MA on April 26, 1954, and passed away on Tuesday, October 30, 2018 with his loved ones by his side. Bill was raised in Auburn, MA and graduated from Auburn High School where he excelled in sports. After high school, he attended the University of Maine in Orono where he played football, was a member of Phi Eta Kappa fraternity and earned his Bachelor’s Degree in Political Science. After college, he fulfilled his dream of becoming a Maine State Trooper. He was one of the first Troopers to be part of the K9 unit, with his beloved partner Bronson. 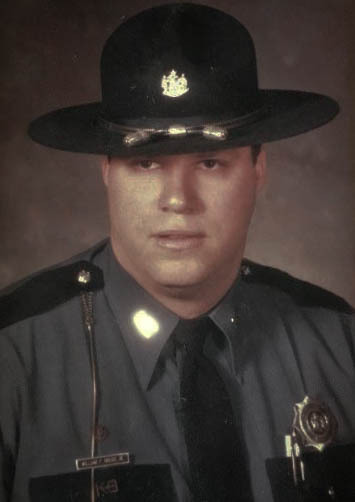 Bill treasured his time as a Trooper, and the lifelong friendships he made. He later moved to Arizona, where he became a business owner in the security sector. In his later years, he moved back to the Raymond Maine area that he loved so much. Bill was known as a loving family man, a loyal friend, a great story teller, the life of the party and a strong leader. He was tough, fearless and stubborn; while also being generous, kind hearted and made everyone he met feel welcome. Family and friends are invited to join Bill’s family for a Celebration of Life (please bring pictures and stories to share) on Saturday, November 17th at Noon at the Auburn Elks located at 754 Southbridge St, Auburn, MA 01501. There will also be another Celebration of Life to be announced shortly to take place in the Portland, Maine area. In lieu of flowers, donations in his honor may be made to Vested Interest in K9s, Inc. via the following Crowdrise link, www.crowdrise.com/williambruso. This organization provides bulletproof vests for K9 officers and will embroider his name on each vest paid for by these donations.